Bring your questions about herbal and natural remedies to this “Ask Cat” episode. I will be taking questions from the audience on anything herbal or prepping related. Listen and call in during the live broadcast. The number is 347-202-0228 and press 1 during the welcome message. Join the live chat room and type your question in there. 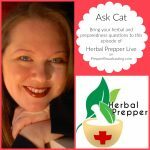 Go to HerbalPrepper.com and use the contact form at the bottom of the page to send me your question. Please keep in mind that I cannot do a full herbal consultation for any individual person on air. Those take longer than we have for the entire show. I also cannot diagnose anyone, as only a doctor can legally diagnose disease. But, I can answer general questions and get you pointed in the right direction. Remember to bring your prepping questions too! Honestly, these are my favorite episodes. The conversations are always different, and challenge how far we can take independent living. For more information on learning about herbal medicine and emergency preparedness, please check out my books Prepper’s Natural Medicine and Prepping for a Pandemic, my videos on my YouTube channel, as well as my online herbal courses onHerbalPrepper.com. Next: Next post: The Prepping Academy is back!